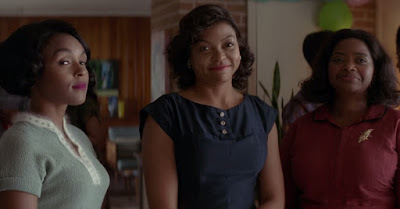 This line is indicative of the film’s frustrating tendency to unnecessarily addend images with obvious slogans, yet the sequence still cuts to the heart of these “Hidden Figures.” After all, this is segregationist America, meaning that once they arrive at Langley, Katherine, Dorothy and Mary are tucked away in a cramped coloreds only room, suggesting a nation that knows these African-American women are indispensable even if it still is not willing to sit in the same room as them. Help our cause, in other words, but don’t be a part of it, a harsh truth of a time that really is not all that long ago in American history. It might have been nice for Melfi to truly honor that harsh truth with a harsher tone rather than the paint by numbers prestige picture gloss he opts for instead, which left me wishing for a better movie even if I couldn’t help but admire how some of the rote clichés he peddles feel intentionately transgressive, like he’s telling white people it’s our turn to be tokens of the plot. 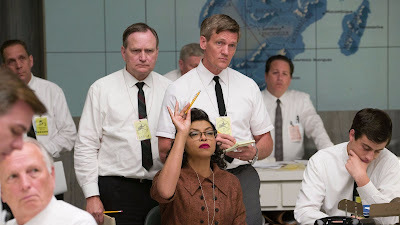 Though Henson, Spencer and Monáe function as a trio with considerably sardonic charisma, they spend much of the movie apart, each one locked into a specific plot. Mary yearns to become an engineer, which requires taking classes that accept neither blacks nor women, which leads to a courtroom scene that Monáe nails, neatly playing it not as an appeal to the Judge’s humanity but to the Judge’s potential legacy, which turns a moment of traditional cinematic speechifying into something slyly comical. Dorothy, meanwhile, yearns to be made a supervisor, given that she is doing supervisor’s work simply without the title, though her supervisor, Mrs. Mitchell (Kirsten Dunst) continually deflects this request because, you know, rules and all that. The tension between these two characters is wonderfully played by Spencer, who maintains such quiet yet tired dignity, and Dunst, who cuts straight to that sort of baked-in racism, like she has been societally programmed since birth to register disgust and/or shock at the mere presence of a black person. The main story, however, belongs to Katherine who becomes part of the Space Task Group, working so hard to get American capsules beyond Earth, led by Al Harrison (Kevin Costner), the kind of guy so consumed by his work that you can never quite tell if he really does see color or not. The others do, of course, and if Melfi doesn’t much burn up the screen with inventive visuals, he at least does a nifty job allowing Katherine to truly drown in these cavernous spaces of so many buzzcut white men in short-sleeve white dress shirts. Chief among them is Paul Stafford (Jim Parsons), whose work Katherine is tasked with proofreading and whose work never sees flawless. You have half a mind to wonder what he's even doing working here, except it's rather evident the Stafford character is payback for the sort of patronizing parts blacks have been made to play for a century. Parsons, to his credit, sits there and takes it. Katherine also gets a subplot in the form of a courtship and marriage to an army colonel named Jim Johnson (Mahershala Ali), which is so humdrum you wish the film would have cut it altogether. Oddly enough, the space flight sequences involving Alan Shepard and then Gus Grissom and John Glenn feel tangential too. Sure, Katherine and the rest of these women help these men achieve that space flight, but we have seen this derring-do rendered in so many movies before that ending a movie deliberately titled “Hidden Figures” with a figure as familiar as John Glenn plays all wrong, marking the first orbiting of the Earth in this context as perfunctory. No, the movie would have done better to conclude a moment earlier, not up in the sky but down on the ground, giving the heroine a true heroine moment. Heaven knows she’d earned it.